Here at JMC we carry a barrage of 2 Post and 4 Post automotive lifts from a wide variety of manufacturers that all say to have the best automotive lifts. Deciding which company manufactures the best lift is up for debate but one thing we do know is that once a client trusts a certain manufacturer, there is no way you can convince them to leave their comfort zone. Choosing the right manufacturer when one doesn’t have a point of reference can stymie any automotive enthusiast but allow us to introduce you to a major player in the industry, Bendpak. These guys have influenced the automotive industry for the last 45 years by being a global leader in the hoist design for everything that has to do with lifts. From alignment lifts, to parking lifts and even vehicle lifts accessories, Bendpak have left their mark. 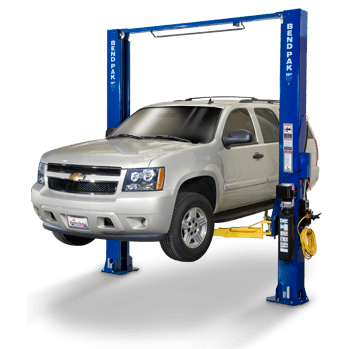 However, they’re known more for their signature 2 post and 4 post vehicle lifts so let us provide you with a guide on a few Bendpak Vehicle Lift models and why they’re acclaimed all over the world. 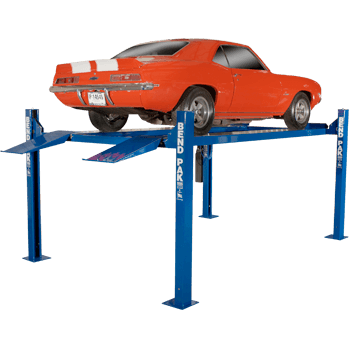 Bendpak two post lifts come in 7,000, 9,000, 10,000, 11,000, 12,000, 15,000 and 18,000 pound lifting capacities so you can work on multiple sized vehicles with lifts from a brand you can trust. If you set up its wide configuration, it will give you 145” to work with from post to post. Unobstructed floor space with their clearfloor convenience. The XPR-10 makes our job as automotive equipment distributors a heck of alot easier thanks to its worldwide acclaim and huge number of sales. It has been one of our highest selling 2 post lifts and is constantly rivaled with Challenger Lifts E10 (see our Challenger Lifts E10 vs. Bendpak’s XPR10: Comparing and Contrasting). Aside from the already mentioned clearfloor convenience found in Bendpak’s 2 post lifts, the XPR-10A gives you the convenience (if your shop requires it) of having an asymmetric lift. Here is what an XPR-10A ‘asymmetric’ lift gives you. The lift columns are rotated 30 degrees from each other, they face the center of the vehicle. You’ll find that its front arms are shorter than its rear arms. Here at JMC our top selling Bendpak Lifts are without a doubt their 2 post lifts but their 4 post lifts are also models when it comes to safety and innovation. Their HD and HDS-Series are industry leaders in construction, materials and technology not to mention added features. Let us explore their HD-9 and HD-9ST. Dual-hub cable sheaves that reduces stress and fatigue on the axles, sheaves and cables. An added value worth its weight in peace of mind. Multi-level locking positions for variable height parking. Electric/Hydraulic power system that is maintenance free that adds dependability. Large base plates (10” x 12”) that provide a solid formation. We decided to add the HD-9ST mainly because this model of the HD-9 allows you to save a lot more space largely due to its narrow build. It’s ideally used in shops that want to maximize their floorspace and mainly store and service smaller vehicles. The HD9-ST features all of the same great specifications found in it’s slightly bigger brother, the top selling HD-9. We know buying a great product isn’t enough, we always want more and that is why Bendpak backs up your purchase with a warranty you can feel comfortable with. They call their warranty, the 5.2.1. Duration - From the date of purchase by the original purchaser or 60-24-12 months from the date of shipment by Bendpak or whichever comes first. Five years - (60 months) bumper-to-bumper warranty on the lift structure. Two Years (24 months) warranty on the hydraulic cylinders and power unit. One year (12 months) Labor warranty on site or at factory. One Year (12 months) free shipping on ground feight charges related to warranty performance. We’ve spoken to many friends in the industry about quality when juxtaposed with price and many agree that Bendpak’s design meets ALI/ETL requirements just as well as any other lift not to mention its design is great as well. They also have one key feature which many other lifts do not have and that is their compressed air lock mechanisms. In layman’s terms, all locks can be unlocked from one position. Many criticize that they’re not powdercoated like their competitors’ lifts are but that’s a small price to pay because let’s face it, wet paint is easier to repair. 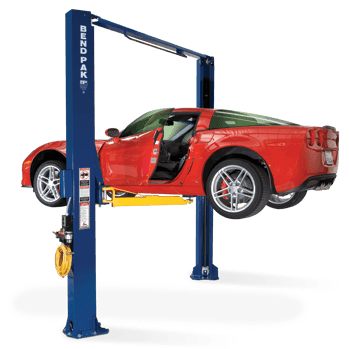 Now, a lot of you may know that Bendpak is found is the preferred lift manufacturer of many big time garages all over the world. One of the garages that endorses Bendpak lifts the most is none other than one of the world’s most awesome garages, Jay Leno’s. Television personality and former host of the Tonight Show, Jay Leno has been known for his long career in television but has also been known for owning over 275 vehicles in his amazing garage. A garage that includes vehicles such as a Mclaren F1, Mercedes 300SL Gullwing and a 1986 Lamborghini Countach. Leno can clearly afford any lift he wants and he opts to go with Bendpak. Many say that it’s a publicity stunt, but tell me, if you owned a priceless vehicle would you use a lift that’s anything less than immaculate just because of publicity? I think not. 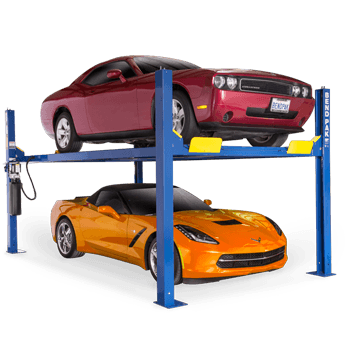 Whether you call them car hoists, vehicle lifts, garage lifts or something completely different just remember Bendpak’s tradition of being found in great garages all over the world. They’re truly industry pioneers and an overall authority when it comes to cutting-edge design, advanced features and unparalleled safety measures. We don’t expect you to have made a decision by now on which way to go but we do hope this guide influenced you just enough to browse over to our “Categories” page, click on “Car Lifts” and then on the left hand side just check-off Bendpak. You’ll see that not only do we carry over 50 different types of Bendpak Lifts but we also have them at the best prices.